I enjoy all kinds of theatre, from the grand spectacle of mega musicals to the gritty naturalism of kitchen sink dramas. I have a particular obsession, though, with gritty and intense productions in unconventional venues. I am also drawn to poetic narratives where the language itself takes you to a very special place. 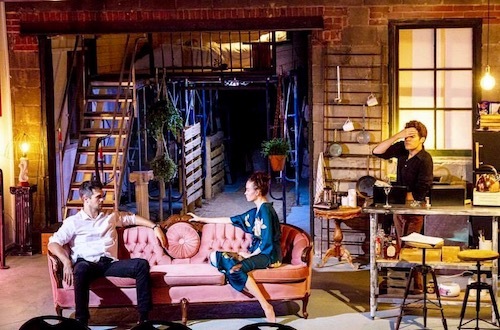 With their stunning production of Lanford Wilson’s Burn This, Gracemoon Arts Company has crafted a theatrical experience that seems tailored to my very specific sensibilities. An abandoned space at 190 McCaul Street has been transformed into an 80’s Manhattan loft. The attention to detail in the set dressing is impressive. Art director Mercedes Papalia has shaped an environment that feels urban, industrial, warm and lived-in. It is so exceptionally intimate and authentic, where things can happen just out of your line of sight—in a bedroom tucked away just out of view or a large mirror where you can glimpse action around a corner. Immediately, we sense sadness, frustration and loss in Anna (Elyse Levesque) as she grapples with these emotions in raw and intense choreographed movement. We soon learn this is part of a dance she was working on with Robbie—a friend, roommate and fellow dancer—who recently died with his boyfriend in a freak boating accident. This tragic event and the memory of Robbie loom constantly in the background. Before Anna, her boyfriend Burton (Mark Stablein) and her current roommate Larry (Ben Lewis) have a chance to properly grieve, Robbie’s brother Pale (Russell Sams) bursts into the loft and brings with him a whirlwind of danger, drama and lust. Pale is, for me, the most intriguing character. He almost has his own language, so full of absurd and surprising observations and fragmented reasoning. He’s angry, animalistic, and his jarring energy throws Anna, Burton and Larry off-track, upsetting their current dynamic and forcing them to do the soul-searching required after the recent loss of their dear friend. In an earlier production of this play, I’ve seen Pale’s epic rants delivered as an aggressive and forceful pounding that was compelling, but exhausting. Here, Sams takes his time with the poetry in Pale’s offbeat tirade, allowing me to fully experience the humour, insight and vulnerability much earlier than I expected. Under Michèle Lonsdale•Smith’s measured direction, all of the characters are given the chance to communicate so much in weighty silences. My attention was frequently drawn to the faces of those who were listening, thinking, waiting and watching. And all four of the performances are so nuanced that you’ll find rich and compelling life occurring no matter where your eyes wander. Burn This is a finely wrought gem, glinting with sharp insights into loss, identity, passion and ambition. Don’t miss it! Photo of Mark Stablein, Elyse Levesque and Ben Lewis provided by the company.